Prof. Ch. Gopal Reddy did his B.Sc. (Mathematics, Physics and Electronics) from Kakatiya University, Warangal and completed his M.Sc. (Physics with Solid State Physics as specialization) and Ph.D. from Osmania University, Hyderabad. He was awarded UGC-NET Junior Research Fellowship by UGC. He is working as a faculty member in Osmania University since 1990. Completed a Research Project under DST-PURSE Programme of OU and another Research Project funded by Atomic Energy Regulatory Board (AERB) is ongoing. In addition, he was Co-Principal Investigator in two Research Projects funded by DST and AERB. Two Research Students were awarded Ph.D. under his supervision and five more are working for their Ph.D. degree. Prof. Ch. 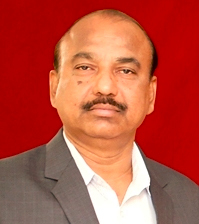 Gopal Reddy has published more than forty five Research Papers in several international and national journals. He has attended several National and International Conferences/Seminars/Workshops. He is Life member of Indian Science Congress Association, Luminescence Society of India, Indian Society for Radiation Physics, Nuclear Tracks Society of India, Indian Association of Physics Teachers and Society for Advancement of Solid State Sciences. Earlier, he has worked as Incharge Head, Department of Physics at O.U. P.G. College, Nalgonda; Academic Coordinator and Vice-Principal at P.G. College of Science, Saifabad, OU; Joint Director and Director, Directorate of Admissions, OU; Head, Department of Physics, University College of Engineering, OU; Dean, Development & UGC Affairs, OU and OSD to Vice Chancellor, OU.